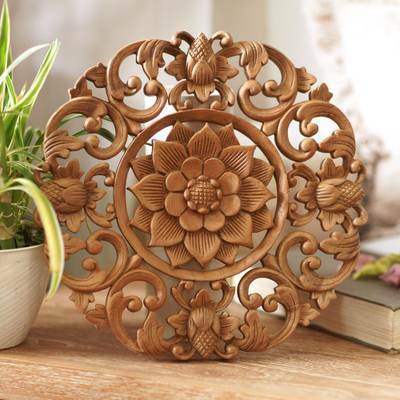 Hand Carved Suar Wood Lily Wall Hanging from Bali, "Peaceful Lily"
For Balinese artisan Sarwaedi, woodworking is a family craft. He has hand carved this elegant wall hanging from suar wood, a local resource that is prized for its striking texture and hardiness. Each of Sarwaedi's carvings are unique, and this 'Peaceful Lily' is no exception. At first glance, the piece looks very traditional, but upon closer inspection one finds those unique details of which the artist is so proud. This wall panel generates serenity in any room. This is an absolutely gorgeous piece. It was much appreciated by the person I gave it to. This is a beautiful woodcarving and was more than I expected!